Transitions define how PowerPoint slides or part of a slide (text or graphics) appear during your presentation. 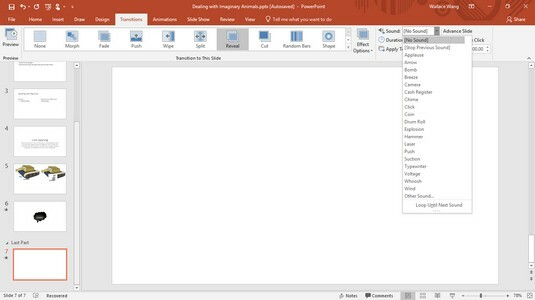 By default, PowerPoint slides appear one at a time with all the text and graphics displayed at once, which can get monotonous. Use PowerPoint transitions sparingly. Transitions may be visually interesting, but too many can be distracting. Slide transitions can make a slide appear to melt or break into multiple pieces that slip away, revealing the next slide underneath. Click a slide (in the Normal or Outline view pane) to use to end the transition. 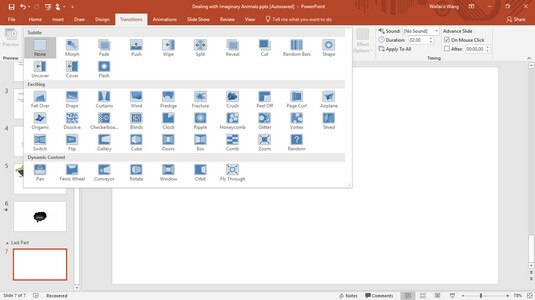 PowerPoint displays the different animation (transition) tools. Click the More button in the Transition to This Slide group. A pull-down menu appears, listing all the different transitions. The More button displays all transitions available. Click the transition you want. PowerPoint shows you how your transition will look. Whatever transition you choose will apply to only the currently displayed slide. In the Timing group, click in the Sound list box. A pull-down menu appears, listing all the sound effects you can choose. The Sound list box shows available sound effects. To make the slide transition to the next slide by a mouse click or after a specified amount of time, select the On Mouse Click or After check box in the Timing group. If you select the After check box, specify a time to wait before running the transition. You can select both the On Mouse Click and the After check boxes, in which case the slide transition waits until you click the mouse or until a specified amount of time passes. (Optional) To apply your transitions to every slide in your presentation, click Apply to All. Applying the same transition throughout your presentation can give your slide show a consistent look, but it’s best for simple, visual transitions — not for transitions that involve noisy sound effects, which will become tedious. Besides animating how your slides appear and disappear, you can also add transitions to your text boxes or graphics so they fly or drop into place across a slide. Use text and graphic transitions sparingly because they can get distracting. People want to read your presentation without having to watch letters zoom around the screen. Click a text box or picture on a slide. 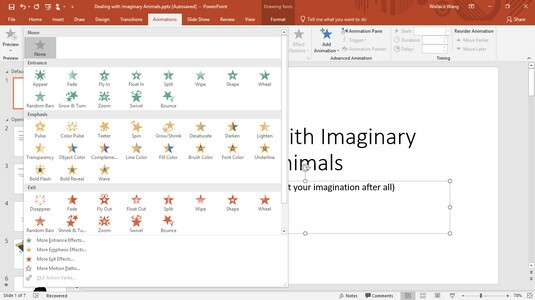 PowerPoint displays handles around your chosen item. Click the More button in the Animations group to display a menu of options. The Animations menu displays various ways to animate text or graphics. Click an animation, such as Fly In or Wipe. PowerPoint displays a number near your chosen item. These numbers define the order in which your transitions will appear. Click the Preview icon to see how your animation will look. To remove an animation, select that text box or graphic, click the Animations tab, and choose None from the Animation group. If you create an animation that you want to apply to other text boxes or graphic objects, you can tediously re-create that transition all over again. However, it’s much simpler to use Animation Painter, which lets you copy animations from one object to another. Click a text box or picture that contains the animation you want to copy. In the Advanced Animation group, click the Animation Painter icon. The mouse pointer displays a paintbrush icon next to the arrow pointer. Click a text box or picture. PowerPoint applies the transition, from the object you selected in Step 1 to the object you selected in this step.